The Make Music Rhode Island Festival on Wednesday, June 21 is not only free and open to the public, it’s open to anyone that wants to take part. This unique event aims to unite all musicians, young, old, amateur and professional, in a statewide celebration of music on the longest day of the year. The event originated in 1982 in France, where the Ministry of Culture dreamed up the idea for a musical holiday. The vision was for free music to be everywhere; street corners — parks, rooftops, store fronts and front porches — where not only could anyone perform, but volunteers would choose to host performances as well. Deemed Fête De La Musique, (meaning both “festival of music” and “make music!”), the Fête became a huge success and a true national holiday. France shuts down, and musicians take over — with millions of musicians performing and over half the country taking to the streets each year to listen. 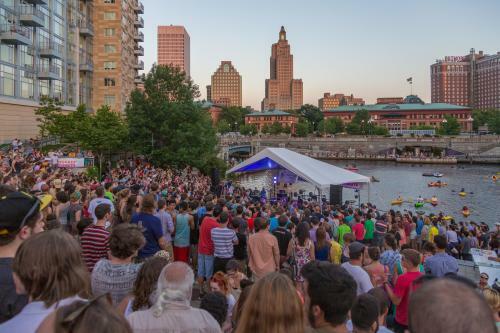 With 750 cities around the world now taking part in city or statewide music celebrations on June 21, this phenomenon has gone international, and now for the first year, Rhode Island will take part in the festivities. From Providence to Newport, towns all over the Ocean State will be hosting venues for this day of summer celebration. For those looking to indulge in the Fête experience in the Providence area, Waterplace Park will act as the main stage of the city for musical merriment. Several artists will take the stage between 5 p.m. and 11 p.m. on the main green, among an ambiance that will surely embrace the neighborly roots of this global event. While you&apos;re in Providence, make a night of it and enjoy dinner at any one of the city&apos;s great restaurants.